This is a wallpaper by American watercolorist Charles Burchfield. It is quite a beautiful design with its mix of soft rounded forms and strong verticals, but seems to be one of his lesser known papers as I don’t see it getting published like two of his other designs, The Birches and Modernistic. It is a rather dense pattern and the ground color does not really show much through the tangle of flowers and foliage. The flowers have all been stylized and reduced to their simplest elements. The Queen Anne’s lace, also known as wild carrot, is formed with a black outline, then filled with numerous lavender flowers, with one red flower in the center. This is interspersed with a wide variety of other wild flowers all rendered in muted colors. Charles Burchfield worked for the Birge wallpaper firm in Buffalo, New York from 1921-1929. 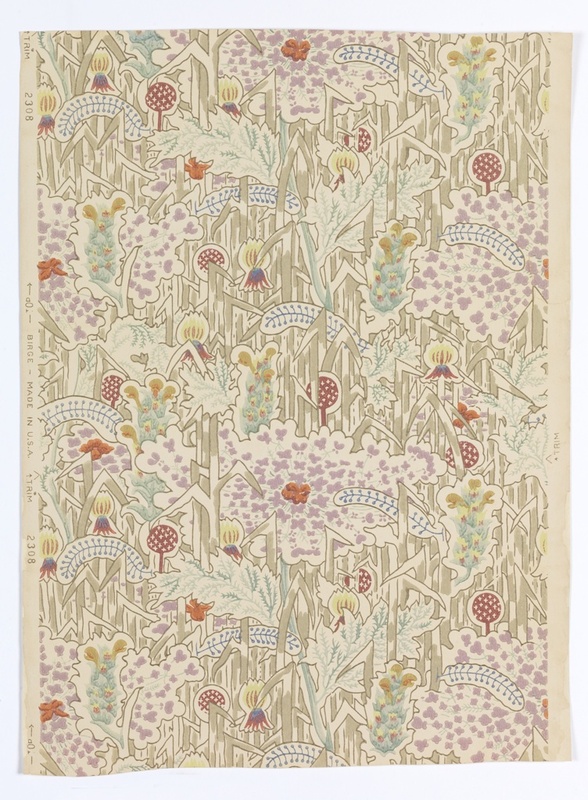 This paper doesn’t have Birchfield’s name printed in the selvedge so maybe one can assume it was produced prior to his Modernistic design in 1927, which, according to Marilyn Hapgood in Wallpaper and the Artist, was such a popular design that all his later designs carried his name. Charles Birchfield was a watercolorist who had a deep fascination and respect for nature. He spent his professional life drawing and painting natural scenes, and this devotion is clearly reflected in his wallpapers as well. The museum collection contains seven different wallpapers designed by Burchfield, and with the exception of one narrow border design, all of these show elements of nature in one form or another. Greg Herringshaw is the Assistant Curator in the Wallcoverings Department. Is there a book of Charles Burchfield’s wallpaper designs? They’re so original and inventive. Hi. I don’t know if there is a book specifically about his wallpaper designs. There is a chapter devoted to Birchfield’s wallpapers in “Wallpaper and the Artist” by Marilyn Hapgood. This is now out of print but can be found on eBay or used book sites. You might check with the Burchfield Penney Art Center in Buffalo for additional information.